Chapter 1: What is colour? Given its importance in analysing and influencing the world around us, an understanding of colour is a vital tool in any design process. Colour design provides a comprehensive review of the issues surrounding the use of colour, from the fundamental principles of what colour is to its important applications across a vast range of industries. 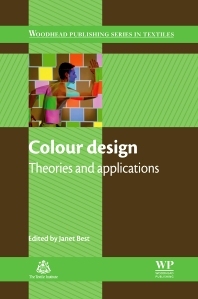 Part one covers the main principles and theories of colour, focusing on the human visual system and the psychology of colour perception. Part two goes on to review colour measurement and description, including consideration of international standards, approval methods for textiles and lithographic printing, and colour communication issues. Forecasting colour trends and methods for design enhancement are then discussed in part three along with the history of colour theory, dyes and pigments, and an overview of dye and print techniques. Finally, part four considers the use of colour across a range of specific applications, from fashion, art and interiors, to food and website design. With its distinguished editor and international team of contributors, Colour design is an invaluable reference tool for all those researching or working with colour and design in any capacity.